Since the FTSE 100 index began in early 1984, the overall performance has not been greatly different to the performance of the “risk-free” 10 year government notes. However, given today’s very low interest rates, returns on government notes should lag the market over the next 10 years. A government bond (gilt) is a security issued by a national government denominated in the country’s own currency. Government bonds are instead typically auctioned.. The first ever government bond was issued by the English government in 1693 to raise money to fund a war against France. Government bonds are usually referred to as risk-free bonds, because governments could easily devaluate their currencies or raise taxes to redeem the bond at maturity. During the last 12 months, United Kingdom government bond yield advanced 0.93 percent. From 1980 until 2013, the United Kingdom Government Bond 10Y averaged 7.4 Percent reaching an all time high of 16.1 Percent in November of 1981 and a record low of 1.4 Percent in July of 2012. Generally, a government bond is issued by a national government and is denominated in the country`s own currency. The yield required by investors to loan funds to governments reflects inflation expectations and the likelihood that the debt will be repaid. The FTSE 100 Index, also called FTSE 100 is a share index of the 100 companies listed on the London Stock Exchange with the highest market capitalization. It is one of the most widely used stock indices and is seen as a gauge of business prosperity for business regulated by UK company law. The index is maintained by the FTSE Group, a subsidiary of the London Stock Exchange Group. The index began on 3 January 1984 at the base level of 1000; the highest value reached to date is 6950.6, on 30 December 1999. After falling during the financial crisis of 2007-2010 to below 3500 in March 2009, the index recovered to a peak of 6091.33 on 8 February 2011, fell under the 5000 mark on the morning of 23 September 2011, but reached 6,840.27 (its highest since September 2000) on 22 May 2013. If I invest £1,000 today in a 10 year government bond at 2.5%, I would have £1,280 in ten years time. Therefore, to compare this to the market, we would need to obtain an average return of over 2.5% per annum over that 10 year period to outperform government bonds. On average, the 10 year FTSE return between 1993 and 2013 has been 5.0%, with 3.5% dividend yield, giving a total average return of 8.5%. In comparison, the 10 year government bond gives a total average return of 8.0%. Therefore, historically, the stock market is outperforming the 10 year government bond yield over the past 20 years. This is to be expected as the 10 year government bond is the “risk-free” rate and hence we should expect a higher return on the FTSE by embracing the elevated risk and volatility. However, the difference is not perhaps as large as I would have initially expected. 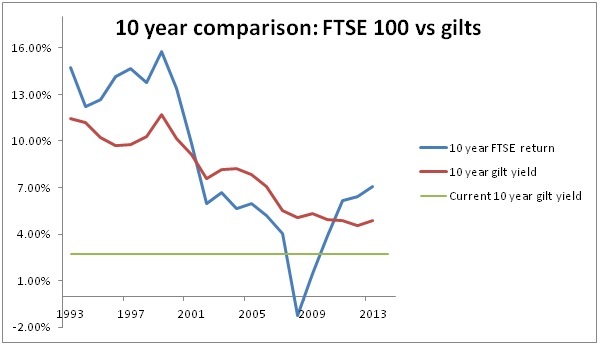 In 12 out of 21 years, the FTSE 100 returned greater 10 year returns than the government yield. In only one year in the past 21 years, the FTSE 100 has returned a negative yield (between 1999 and 2008 the FTSE returned -1.24% per annum). Therefore, on average, you are gaining an additional 0.5% per annum for the possibility of losing part of your capital in one year, or underperforming the risk free rate in 9 out of the 21 years. The 0.5% doesn’t seem like much. However, as we all know, small changes in rates can add up over time. £10,000 invested in 1984 in government bonds would be worth £49,855 today. £10,000 invested in 1984 in the FTSE 100 would be worth £54,287 today. Therefore, embracing the additional risk has returned £4,400 more in the FTSE, or an additional 44%. In the graph above, the “2013” figure shows the return from a 10 year bond purchased in 2003. Today (27th November 2013), the 10 year government gilt yield is 2.73%. This is a much less attractive yield than those previously offered and is caused by the very low base interest rates set by the Bank of England. If we compare this to historical FTSE 100 returns, there has only been two years where the 10 year return has been less than 2.73% (1999-2008 = -1.24% and 2000-2009 = 1.49%). The average returns of 8.5% are much, much greater than the returns on the risk free rate. Today, the stock markets continue through a period of volatility. However, the increased risk over the next 10 years compared to the very low government gilts is more than rewarded by the much higher returns expected from the FTSE 100 compared to the government gilts. This is why people have been saying “equities are the only place to go” for the past couple of years. Yes, the FTSE could collapse 40% next week. But, the chances are, within 10 years time, it would have recovered to a level, which returns greater than 2.73% per annum including dividends. That’s a much harder question. Why not check out these posts to give you an idea of when is the best time to invest? Many times over, I have either read or heard about how one can make real money in stocks, bonds, etc but this is a subject I find so hard to study. But then again, glad that you and others like you share what you know.